Salmon caught on the coast of California are considered huge when they weight 20 pounds. Some salmon in rivers around Talkeetna weigh in at 50 pounds. 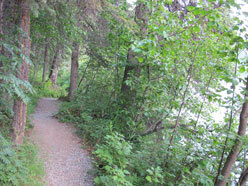 Your guide will take you to rivers like Montana Creek and the Susitna. Your fishing experience will make adventures in the the lower 48 seem tame. There are great fishing adventures that can be combined with a terrific boating experience. Your guide will take you through all the steps from, if necessary, teaching you how to fish, getting the gear, clean and UPS your fish, whatever is necessary. We will take you out to Cache Creek mining territory, where gold has been pulled from the river and ground for a hundred years. The road to the territory seems to have more in common with the Pleistocene era than the 21st century. At Cache Creek there aren't any bears - only bear tracks. (As John Wayne remarked to a tenderfoot who said he didn't see any Indians - "Don't worry pilgrim, they see you.") And, according to the many miners in the area, there isn't any gold, just lots of people getting an early start every day digging and panning and smiling. If you just have a couple of hours, we can take you on an easy, gorgeous walk into the wild, around beautiful lakes. You'll get to touch, feel, smell and behold the beauty of Alaska without getting lost or getting into a legal dispute with an ursus arctos horribilis (grizzly bear) about the validity of Darwin's Law of the Survival of the Fittest. Alaska is a panorama of geography that at times can stop your heart with it's beauty. The best way to to see Alaska is from the air. You'll quickly see that there aren't any people - there are more people in San Jose, California, than in all of Alaska. You get to see some of the most magnificent terrain on Earth - no development, no roads, no domestication, no national parks surrounded by farms - what Earth was like before man. If you are the builder or construction type, we can take you to lodges and cabins under construction - you'll be shocked at what can be done when there is almost no building code, and where lumber can be had at 5% of the lower 48 price, and what it really means to be "off the grid". Then again, you'll thank your stars that you live in the lower 48 when you hear of the crazy things that have to be considered when you build on permafrost, where plumbing and heating have to function for months on end of 30 degrees below, and where beavers can submerge your house in a swamp. River boating around Talkeetna is like riding some weird battle craft that is half airplane and half jetboat - going upstream you are in the air as often as you are on the water. It is an exciting adventure. If you want something special where you get deep into the bush - give us a call. We can take you into the wild for a day or a week - an incomparable experience - fishing, hunting, photography, gold mining - memories that will last forever. We take care of all gear and food. If something comes up where you have to get to Anchorage or some other place NOW and FAST - call us. 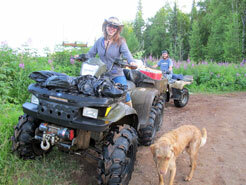 Or if you just need to get back to your lodge after learning about Alaskan drinking habits, give us a call, anytime. Warning: if you are driving yourself around Talkeetna, or generally anywhere in Alaska, don't speed, in fact, drive slower than you think is safe. Roads are also used by moose. They don't look both ways before crossing, suddenly. Moose on car crashes often result in fatalities for all creatures involved. Given the various seasons and licenses necessary, your guide can take you safely and legally into the woods to find a prize animal. We can set you up with gear. The guide will know what can be hunted. But be forewarned - you will be intimately involved in the butchering - we do not get involved in hunting for sport. You will be personally helping in carting out the meat - hundreds of pounds of it. Somebody is going to eat it - you, family, friends, or customers at local restaurants. Though all of our tours have spectacular photo opportunities, we can customize a two to four hour tour for just that purpose. of Parks Highway, down an endless maze of dirt roads, all walled in by impenetrable trees. You won't find many houses, you won't know where you have been, you will get lost and you could run out of gas. The guide knows hundreds of interesting residences. He can take you down wandering; going nowhere roads to a majestic lodge you just would never have known was there. And Alaskans are past-masters at making 20x30 foot cabins into artistic castles. Your guide has key data that are essential, that can kill a project quickly or eventually. You will be shocked at how cheap and endlessly available land, lumber and water are, and at how expensive and limited construction tools, equipment and supplies are. Should you actually want to start talking about buying something, our guide can take you through all the things you have to know for any property. He can go over with you what's involved in buying a turn-key home, or the difficulties you will have in repairing a fixer-upper. You might be intrigued by the possibilities of gorgeous wilderness property on a lake far from any roads - fantastic property and unbelievably inexpensive: he will have the bad news about wilderness construction costs that you simply gotta have before buying. Well-drilling, permafrost consequences, building codes, what can and can't be done in the winter, how to get local help, off-the-grid electricity; he can help with all the details of construction in Alaska. Though not a realtor, he is very knowledgeable and can effectively help you with the whole purchasing process. And whatever your interests, he won't be running his own plan that ends up with you signing some paper.